Oliver, being a good animal. Scott and I did a duathalon two weeks ago, which is kind of hilarious if you knew how out of shape I am. It’s even more hilarious because it was my idea to begin with. I thought it would be fun. I thought that somehow, doing an off-road-trail-race-mountain-bike-ride-relay would make us into a certain kind of family, much like the beautiful ones I flip through in the Prana and Patagonia catalogs. It wasn’t that much fun, to be honest. On the way to the race, I felt myself regress back to who I used to be when I could run sixteen minute 5Ks. On the way to the race, while the boys shouted out the names of trucks on the highway, I started to get tunnel vision. It became difficult to concentrate on what everyone was saying. It was as if I was in some invisible time machine and all I wanted to do was to pull up the hood of my Champion sweatshirt and blast U2 on my Walkman. You are being ridiculous, I kept saying to myself as I fought to keep my tone light and pulled out snacks for the boys. Even though I am the poster child for “weekend warrior,” my brain still thought I was gunning for the Olympic Trials. It was a pretty low-key race to say the least. And still. There I was, walking up to the Virginia State Park public restroom with Oliver, thinking I should be doing some striders or drills or something to get my heart rate up. By the time the race actually started and I chugged up the little road that led to the trail, I was exhausted. All that useless adreneline had pumped blood away from my hands and feet which were now numb and cold, and I could barely breathe. I spent the first leg of our relay beating myself up for being such a freakazoid about this silly little fun run. As I finished the 2.5 miles and ran into the transition zone, I watched other couples hand off. A team of guys yelled “goGoGO,” at each other and a cute young couple kissed. I kept running until I reached Scott and the boys. “I’m sorry,” I said, gasping for air. I forget how I acquired my first George Sheehan book, but it must have been from my parents who took up running in the late 70’s. Sheehan was a cardiologist who ran at lunch time and in weekend races, but mostly, he was a thinker. His books were kind of like a guidebook into the soul of running and had so much to do with why I loved the sport. When it was time, the boys (begrudgingly) got off their bikes and we waited for Scott to come in so I could run my second and final leg. He rode over and gave me a high five and I headed off again into the woods. This time it was easier. This time, I didn’t care so much. This time, I remembered how to land on the edge of tree roots and slop through streams. Running in the woods has always been something special for me. Like gears syncing up, my heart and head become aligned and the pattern of the universe reveals itself a little bit, like a rent in the lining. My body too knows how to be a good animal. I swam in my first meet when I was five and ran in my first race when I was eight. I competed for decades and I know how to do it, how to prepare for it. 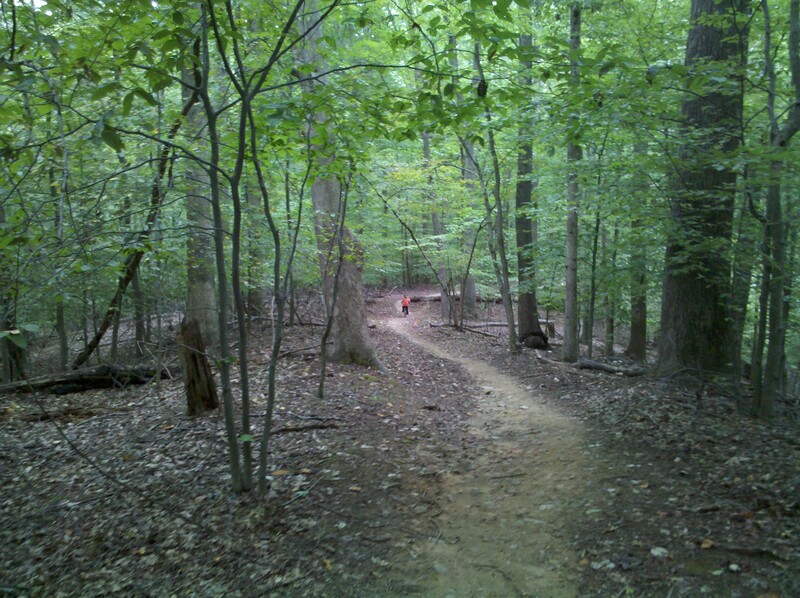 As I ran through the Virginia woods last week – or more accurately, as I jogged while people passed me – I realized that my pre-race tunnel vision and macabre sense of concentration were simply habit. All my body wanted to do was to be a good animal, to do what it was trained to do, like a slobbery Newfoundland who wants only to jump into the lake and save the swimmer from drowning. What also occurred to me after the race, when I had a moment to think, were all the other things I do that are simply habit. It’s so easy to blame ourselves for being too selfish or too submissive, for eating too much or not enough, for yelling too much or for not standing up for ourselves, for doing too much or doing too little. But really, these are merely habits that, at one time, served us well. When I was in my twenties and making my way out of a dark tunnel of disordered eating, I read all of Geneen Roth’s wise books. “There are exquisitely good reasons,” she wrote, “for doing what we do, for believing what we believe.” We are so quick to feel ashamed, but most of the time, our bodies are just trying to be good animals. They are trying, as they always do, to save us. September 27th marked the New Moon for the month, which I have recently learned is a good time to gather some intentions and wishes for what you want to bring more of into your life. It’s also a good time to get rid of worn-out habits that don’t serve you anymore. Jeesh. I’m rolling my eyes at myself, even as I write this, because normally, this isn’t the kind of thing I typically take part in. I’m just not a visionboard kind of gal, I guess. But, I recently took a 4-week online course entitled Self-Love Warriors put on by Jenn Gibson of Roots of She and during the month, there was a conversation about new moon rituals that intrigued me. And so, eye-rolling at myself aside, I am thinking of some new habits I want to cultivate as we move into fall. As usual, that list includes eating more kale and less sugar. Getting more sleep and committing to fewer activities. But I think first and foremost what I want to do is to respect the good animal part of myself – that true and loyal part of each of us that is committed to our survival at all costs. Perhaps your good animal is wiser than mine and has led you into nurturing behaviors. Or maybe your good animal is like my own and dashes off unexpectedly after a squirrel in the woods. Regardless, our good animals deserve gratitude rather than shame for bringing us this far into our own good lives, hearts beating, blood pumping, lungs breathing. I wish I could be more eloquent but it’s beyond me right now. wow pam, you are a writer. a writer in your bones. thank you for that piece of your life and times. miss you in my life! Oh how I love this……I’m sort of speechless. This will help me. Thank-you. I want nothing more than to be a good animal. Wow. Pamela, I’ve just read this three times, once for the story, once for the beauty of your words, once more to imprint them on my heart. You are already a teacher. And you are one good animal — not to mention an amazing writer. thank you!! How inspiring! We all should take more time to “be good animals.” Although NO way am I exercising like you and your husband did. I’d pass out and whine for days. Nurturing behaviors…….OK. I like it. By the way, you are better at way more than you think you are. Thank you. EVERY time I come here I learn something, about myself and about you. And both are a gift. Thank you, I feel as though I’m going to turn this around in my mind over and over because I love the simplicity and logic of it. “Like gears syncing up, my heart and head become aligned and the pattern of the universe reveals itself a little bit…” That line makes body, mind and universe line up in a great resounding soul-stirring song. Thanks to you, and this beautiful post, I’ll devote my day to being a good Newfoundland. Off to the beach… Arf! I echo all of the compliments of the previous commenters. What a delight and a privilege it is to read your words. Pam, this was a beautiful read. I just realized I have never read your work. It’s wonderful! Very eloquent and elegant at the same time. I look forward to more. Now the cars stop and all the good animals get out. And now look where all those good animals are going. To the tree. To the tree. Up the tree. Up the tree. Up they go to the top of the tree. Why? Will they work there? Will they play there? What is up there on top of that tree? A big good animal party! Big good animals, little good animals… are all at a good animal party. What a good animal party! Hello again and now do you like my hat? I do! What a hat! I like it. I like that good animal party hat. Pamela, your peregrinations never cease to amaze. The most beautiful piece of music I know is from Carnival of the Animals, by Saint-Saens (Aquarium). I think they played it at Bruce’s party above. You are one of my very favorite animals, and you are so, so good. I just love this. It’s beautiful and also, actionable. We can all think of good-animal habits that we drag with us, even if we have evolved past them. I know I can. Thank you for this, and for your very fine — and refined — sense of lyricism and and language. I love the idea of our bodies trying to be good animals – such a profoundly new way to look in. I often sit in awe and think of how much I put my body through while it continues to chug along keeping me alive and healthy. Thanks for bringing my attention back to being a good animal and remembering that these habits did once serve me well, but that some need to be dropped before the new habits can take roots. You are currently reading Good Animal at Walking on My Hands.